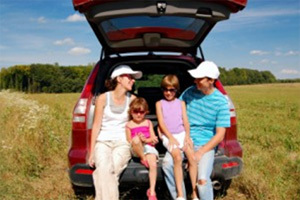 According to the Bureau of Traffic Statistics, approximately 91% of summer trips in the United States are taken by car. Hitting the road during the summer is an American tradition, but planning for the trip goes far beyond purchasing a new bathing suit or finding a kennel for Fido. It’s also about making sure your vehicle is prepared for the elevated summer temperatures and the hours spent stuck in urban traffic jams or cruising a barren desert highway. Avoid a potential disaster such as your shock absorbers going out, by making your car road-worthy before hitting the pavement this summer. Your coolant system is vital to maintaining your car, especially as the temperatures rise and you spend hours cruising down the highway. Have your car’s radiator pressure checked, which is performed at several auto shops free of charge. While there, ask the technician to examine and replace any broken, warped, or torn radiator hoses. If your water pump is past its prime, have it replaced as well. The last step is to flush your coolant system. The flush removes any oxidized, gunky antifreeze and helps reduce stress on the radiator. Imagine sitting in a traffic jam during a heat wave with a car full of crabby children and the air conditioning quits. Take your car into the shop and have the air compressor, condenser, evaporator, lines and hoses examined. If you turn on the A/C and your car is blowing warm or cooler air instead of the Arctic blast you’re used to, it’s time to have your Freon recharged. You might also have slow Freon leak, especially if you have a late-model vehicle, which must be repaired as well. Examine the tread wear on your tires. If the tires are severely worn, have them replaced immediately. Also, if your vehicle’s currently sporting snow or winter tires, consider swapping them for all-season models. Winter tires are designed to drive on cooler, icy roads and feature softer rubber, which degrades quickly on hot asphalt. Check your tire pressure at least once-a-week throughout the summer and add air accordingly. Not only does this extend the tire’s life, it also cuts down on your fuel costs. If you’re planning to take several trips this summer, long or short, it’s crucial to have your oil changed every 3,000 miles. Consider switching to a higher viscosity oil during the summer months. Higher viscosity oil is thicker and maintains its consistency under warmer temperatures. Consult your owner’s manual to determine your vehicle’s viscosity level recommendations for the summer months. Summer storms pop up at a moment’s notice, which requires that you have fully functional windshield wipers. Examine the blades and replace them if worn or broken. Also, check the wiper fluid levels and fill up the reservoir to ensure your vision isn’t obstructed by the unavoidable dead bug splatters on the windshield. Flip on your headlights and turn signals to ensure the bulbs aren’t burnt out. Replace the bulbs, if necessary, and replace any cracked or damaged plastic covers. Clean your headlights, brake and turn signal lights periodically throughout the summer with an all-purpose household product and a rag, especially if they’re covered with mud or dead bugs. This ensures your fellow drivers have no trouble seeing you on the road. Now that you’ve prepared your vehicle’s components and exterior for summer driving, it’s time to get the interior ready for the heat, kids and long drives. Invest in a sun shield (especially if you’re forced to park in the sun for several hours a day). Protect your leather seats by applying a conditioner, which prevents cracking and drying. Remember to store a travel-sized container of wet wipes in the glove box to clean up any spills before they become permanent stains. This post was written and contributed by Edson Farnell. Edson writes about various automotive topics. Many of Edson’s friends refer to him as the Auto Parts Geek.